Last Friday was the conclusion of the “I Dig Zambia” virtual summer camp, co-organized by the Field Museum and Global Kids. I Dig Zambia was a two-week camp that brought together 19 teens from Chicago and New York to learn about paleontology, biology, and Zambian culture and politics in the virtual world of Teen Second Life. Now that our teens have solidified their Second Life skills and learned how to work with their teams across cities during the first week, we ramped up our activities to be more intensive and collaborative. It was by no means an easy week for our virtual campers, but I think it was engaging, surprising, and often fun. The most challenging and important activity of I Dig Zambia was the assembly and presentation of the fossil exhibits by the four teams of campers. This activity drew upon every bit of knowledge they had amassed about paleontology, their assigned fossil, and Zambia, and required that they work together collaboratively to finish their exhibits in a very short amount of time. That said, they did an outstanding job. IDZ interns Nate and Chris worked together to create a realistic exhibit area for the teens exhibits, that helped everyone to mentally imagine their work in a real museum. Many of the teens were quite meticulous about the placement of their fossils, the associated images, text boxes, surrounding flora and fauna, and other details. Here’s the Blue Team with their exhibit. After placing their exhibits, we had the teams decide on representatives from Chicago and New York to come up to the mic and orally present their exhibit to the rest of the campers via Second Life voice. It was a nice way to summarize their research and get a sense of what it might be like to do this in real life. Here’s one of our New York teens Amana presenting on behalf of her team. In the second week of IDZ, the teens got a deeper understanding of the life of a scientist by interacting with the paleontologists in Zambia. We showed the teens several more videos sent back from the field and got to talk with them over satellite phone. Beth and I this week passed the phone around to our teens so that they could ask questions directly to the scientists, which greatly increased their engagement with the conversations. At the same time, the somewhat sketchy audio quality of the satellite calls made the discussions often difficult for the teens and the adults to follow. This week our teens got to read more letters from the Field Museum videographers in Zambia about their experiences with Zambian youth, which our teens like a lot. The photos sent back help them get a better picture of life in rural Zambia. And this week we got to see several videos of Zambian youth, including them singing and talking about HIV/AIDS and their somewhat problematic relationship with elephants. Week Two we had an easier time getting our teens across cities to work together, now that they had several experiences together. That said, when they had questions or problems, our New York teens were more likely to ask their fellow New Yorkers in the room rather than their Chicago counterparts, a phenomenon I blogged about in another post. Dividing them into cross-city teams was definitely the right thing to do, in general. It made our teens use of the virtual tools necessary for completing their projects, from public chat, instant messaging, sharing and manipulating group-owned objects, and drafting notecards of textual information. On the final day of the camp, we decided to set up a Skype video call between the teens and have them all crowd around a screen to get to see each other in full video for the first time. They found this tremendously exciting and fun. It makes me wonder what the camp would have been like if we had included this earlier or more frequently. Working with Second Life developer Amulius Lioncourt, we created a number of interactive experiences and games within Second Life to help educate our campers about various aspects of Zambian culture. To demonstrate how Zambian communities cope with regular climatic changes in Zambia, we created a fishing experience for our teens. They were given fishing poles and led to a fishing pond where they could dip their poles in and see what they caught. Very few fish were caught by the teens, and they generally found this frustrating. We used this as a jumping off point to talk to our teens about how communities deal with regular seasonal changes, and how interconnected their livelihoods are with nature’s cycles. Truthfully, this experience was not as successful as we would have liked due to lag, delays in the scripted actions, and a truncated activity schedule. Copper mining is the number one industry in Zambia. We created an experience to demonstrate what a hazardous and difficult job this was for the miners. Each teen was given a pickaxe and told to mine in a cavern. Every few blows, they were awarded with one Linden Dollar, which is the equivalent of about 1/3 of a cent. In addition, they had a high likelihood of some kind of accident befalling them every few strikes, from a rock falling on their hand, contracting a kidney disease, or getting injured by mining equipment. To add insult to injury, I acted as the corrupt mine foreman, occasionally firing individual workers for various reasons. We succeeded in our goal of showing how difficult and unfair the life of the average miner was in Zambia. What we didn’t anticipate was one of our Global Kids teens Amana trying to organize the other workers to strike against the mine owners for better conditions! I should have known that our teens wouldn’t take this exploitation lying down. The IDZ educators wanted to create an experience that helped our campers learn about the complex nature of the relationship of humans and animals in countries like Zambia. We decided to focus on elephants, which both well-known African animals with both negative and positive connotations. The campers were told that they had to farm two plots of land near their campsites. Beautiful acacia trees framed fields dotted with brownish plants. As the teens walked to their land and typed “plant crops,” green plants sprung from the earth and swayed in the wind. Then over the horizon, a mean elephant (me, wearing and elephant avatar) thundered over the hillside and trampled their crops, ruining the fields. ephants ruining their crops. Some teens suggested we kill the elephants. We then told our teens to build a fence around their fields to protect them against the elephant, and then observe what happens. The teens went to down on the fence-building activity, creating fortress-like structures protecting their small plots of land. One teen even succeeded in trapping the elephant in a cage, but another teen teleported the elephant out, which was hilarious. While the teens were successful in protecting their crops, they noticed that many of their acacia trees started to die. These trees had small beetles on their trunks that apparently were responsible for their death. Beth explained that when the elephants feed off the acacia trees they facilitate colonies of ants living on the trees, which helps protect them from the beetles that destroy the plants. Thus, elephants have both positive and negative impacts on the landscape that need to be taken into account. One of our most successful activities from last year’s I Dig Tanzania was “avatar adaption.” The IDZ teens also enjoyed this game, that let them show off their avatar customization skills. Teach team was giving a different environment that they had to adapt their avatar to best survive within. One team was given the rainforest, another a deep cave, a third an icy snowscape, and a forth the desert. Our last virtual activity was a fun one. The teens learned about the energetic muganda dance tradition of the Lusaka tribe and the kalindula music genre that is popular throughout Zambia and neighboring countries. Then they got their avatars dancing together on an outdoor dancefloor, surrounded by African animals and plantlife, laughing about the silly movements their avatars were doing. We spent most of the final day of I Dig Zambia doing offline tours of the Brooklyn Botanic Gardens and the Field Museum of Chicago to get our kids up and moving. 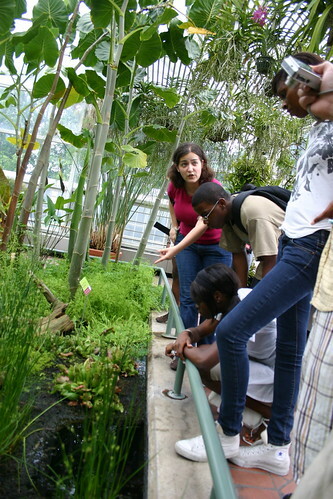 On the New York side, we focused on the “Wicked Plants” exhibit at the botanic gardens. It turns out the our educator Rebecca knew a surprising amount about botany, explaining the naming structure for plants, their different structures, and some of the more lethal varieties of plantlife. Frankly, most of our kids were interested in just hanging out with each other as a group for the final few hours of I Dig Zambia. Some of them are graduating seniors off to college in the Fall, and the rest come from various schools around New York City. So it’s unlikely that they will all be together like this again in the future, which was a sad realization for many of them. The Chicago teens meanwhile got to do some African drumming with a couple of local musicians teaching the kids about the different beats and drumming traditions in Africa. Really fun! Tashawna: My favorite IDZ experience was the dance party and the digging of the fossils. At the dance party I was the first to start dancing. We were dancing to music from Zambia. The beats were amazing. I was really dancing along with my avatar. Digging up the fossils was fun and quite a challenge. At first we didn’t know how to dig up the fossils but after a while we got it. I kept getting my fossils stolen but it was alright. Abraham: The activity that we did after seeing the video on the Grassroots Soccer was very helpful because I personally learned and I taught others about the effects of having HIV/AIDS in one’s life with all the other things in one’s life. I liked that because of the soccer activity that we did we worked as a team and fell as a team literally “doing push-ups”. 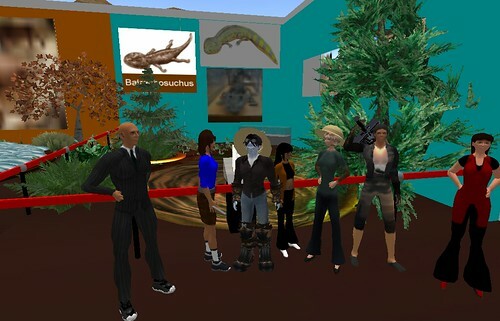 Jovann: Learning in second life has been really awesome for me because I can’t physically go to Zambia and dig for fossils and doing it on second life sped up the process because I don’t think I have the patience or the skills to get the fossils out safely. Shonell: My favorite experience in IDZ would most likely be just how we worked in second life. I say this because I have never been involved in second life before and just the thought of working as a character of myself have been very interesting. Also just because we got to socialize with other people it felt more comfortable doing it in second life than if I had to do it in real life. Rowana: Over the past two weeks, I think that I have developed better communication skills. I’m a shy person and I’m not used to being thrown into problem solving situations with strangers, but IDZ forced me to communicate better with others. I’m not very into computer games or programs that use virtual reality, and so IDZ also helped me develop my technological skills. 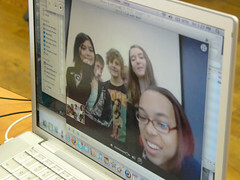 More teen blog entries on the Global Kids blog. This brief overview does not begin to capture the wide range of activities and experiences our young people went through as part of I Dig Zambia. There were many informal and formal, offline and and online interactions that occurred over the two weeks that I could spend many more pages of text describing. Fortunately, a team of researchers will be doing just that, going over the text logs, audio captures, videos, and pre- and post- evaluations to come to their own conclusions about how effective IDZ was as an educational project. From my perspective, I Dig Zambia was an excellent demonstration of how groups of teens across distance can work together, connect with youth from other parts of the world, learn from researchers in the field, and collaborate in a virtual environment. Our campers learned about a part of the world they knew almost nothing about previously, gained a richer understanding of the field of paleontology, thought deeply about the challenges of HIV/AIDS, labor inequalities, climate change and human-animal interactions. And they had fun in the process. computers, and cameras for the research and video teams in Zambia. 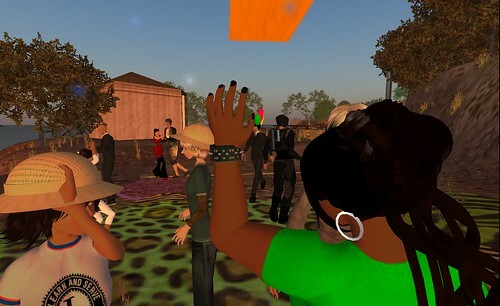 IDZ showed how virtual worlds like Second Life can be rich mediums for various forms of engaged learning, from 3D building to facilitated discussions to topical games. Combined with other social media tools like VOIP, web-based games, and video-hosting sites, these media offer young people experiences that can change the way they view the world and themselves. 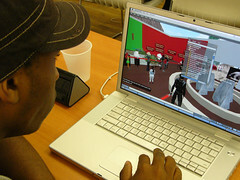 While these virtual tools can not replace the emotional and psychological depth of connections in face-to-face settings, they can expose young people to ideas, information, and perspectives that are real and empowering.